Home to the original capital of the United States before it was shifted to Washington D.C., Pennsylvania is famous for its contributions to the Revolutionary War. The first Continental Congress convened in Pennsylvania, where they drew up the Declaration of Independence and the Constitution. The famous Liberty Bell is on display in Philadelphia. 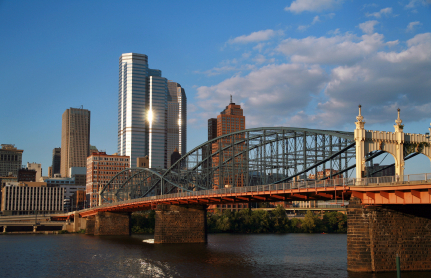 Today, Pennsylvania's biggest industries include steel production and history-based tourism. Comparing quotes online is a fast and easy way to find the most affordable car insurance rates in the Philadelphia area. A good understanding of the rates you can expect when you move will help you plan a budget and purchase your insurance as soon as you arrive in Philadelphia. Current Philadelphia residents can also benefit from an online car insurance quote comparison. Common life changes, like finding a new job or changing your driving habits, can cause your insurance premiums to go change dramatically. Start by knowing the basic insurance requirements and then look at additional coverage you may need. Then you'll be ready to compare car insurance quotes for the best rate. You must choose full or limited coverage. Under Full Tort, your right to compensation for injuries caused by another driver is unrestricted. If you are new to the state, it is important to transfer your out-of-state driver's license to Pennsylvania, as well as any vehicle registrations, as soon as possible. Pennsylvania offers a standard 60 day waiting period for license transfers, but you must take care of registration and title transfers within the first 20 days after you become a Pennsylvania resident. Would you like to know how much you could be paying for car insurance in Pennsylvania? Enter your zip code into the field on this page to find out. Drivers who need to transfer their out-of-state licenses must visit a local Driver License Center to turn in the appropriate paperwork and surrender their old license. New residents can search for their closest Driver License Center through a quick online form on the Pennsylvania Department of Transportation website. Driver License Centers can also administer physical or written driving tests to those who need them. Out-of-state transfer applicants will need to complete the Application for Pennsylvania Non-Commercial Driver's License by Out-of-State Non-CDL Driver form, as well as provide proof of residency and proof of identification. Proof of residency documents include a certified birth certificate or certificate of naturalization, tax records, lease agreements or current utility bills. You must also present your social security card. Proof of identity documents can include the previous documents as well as a photo ID. You can use your out-of-state license as your ID as long as it has not been expired for more than 6 months. Official passports also qualify as valid photo identification. Transferring your driver's license can range from $19.00 to $34.50 depending on your age and whether or not you need a motorcycle license as well. Anyone below the age of 65 will have to pay $29.50 for a Pennsylvania 4-year license. People over the age of 65 can purchase a 2-year license for $19.00. Motorcycle owners can purchase 4-year combined licenses for $34.50 if they are under the age of 65. Anyone over 65 who needs a motorcycle license as well as a regular driver's license will be charged $24.00 for a 2-year combined license. Drivers who can present out-of-state licenses that have not been expired for more than 6 months can skip the driving test. The must pass a vision test before they are issued their new license. Learner's permits from other states are not transferrable to Pennsylvania. If your license has been expired for more than 6 months, you will have to apply for a Pennsylvania learner's permit and complete all of the qualifications that are required of anyone seeking their first Pennsylvania driver's license. These qualifications include written and physical driving tests. The grace period for new Pennsylvania residents who need to transfer their vehicle titles is only 20 days. If you are planning to move to Pennsylvania, it is a good idea to be prepared to transfer your vehicle's title as soon as you set up residency in the state. Delays in processing the paperwork could cause you to be late in filing your transfer request, which could lead to additional fees in some cases. You must also have a valid Pennsylvania identification card or driver's license to transfer your vehicle's title, even though the deadline for transferring your driver's license is longer than the deadline for transferring your title and registration. Vehicle owners must visit an office of the Pennsylvania Bureau of Motor Vehicles in order to transfer title and registration to Pennsylvania. Form MV-1 is a required document for vehicle title transfers, but a representative of the Bureau of Motor Vehicles must complete the form for it to be valid. This form is not available online. Authorized agents do not necessarily work directly for the Bureau, however. You can find authorized agents at car dealerships, banks and messenger services. Most notaries are also authorized agents who can complete the MV-1 for you. Sometimes a lien-holder will require that the customer refinance their vehicle with a lien-holder that operates in Pennsylvania. There may also be some fees involved in the lien transfer. The Pennsylvania Department of Transportation will not issue the title unless the vehicle owner can present the official title for the vehicle, as well as the completed MV-1 paperwork. If your lien-holder will not release the title, you may need to pay off your initial lien and transfer it to a local bank or lending institution. You will not receive a Pennsylvania license plate until you surrender your out-of-state plates. Transfer requests require specific paperwork. You need to bring your current out-of-state title that bears your full name. You will need to provide valid proof of insurance with an agency that can legally sell insurance in Pennsylvania. You must present an official tracing of the VIN (vehicle identification number) from your vehicle, which you can obtain from an inspection mechanic, a notary or a car dealership. If you are leasing your vehicle, the company you are leasing from will need to complete an MV-1L form and submit it. Sometimes the leasing company will need to submit a Power of Attorney as well. Newer vehicles are required to meet more stringent emission controls than older vehicles. If your car was manufactured in 2008 or later, you will need to present certification from the California Air Resources Board. You can receive this certification when you have your car inspected by an inspection mechanic. Regardless of age, cars that have less than 7,500 miles on the odometer will also be required to undergo emissions testing and pass at the same level required for newer cars. Newer vehicles that weigh 8,500 pounds or more are exempt from this requirement.